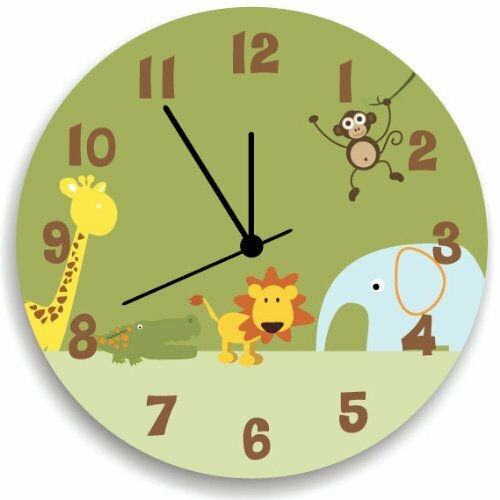 Nursery Wall Clock, Giving a new atmosphere to any nursery! Measurements approximately 10.62" Diameter and 0.14" high The printed is adhered to the wood, This quality print come with brilliant laminated. The edges are painted dark color in order to make the perfect ending to the wall clock. Our kid-friendly wall clocks are for indoor use only. All wall clocks can be clean with a soft dry cloth. The clock requires one AA battery which is not included. It's come with clock mechanism at the back with a hook to hang it on. Each clock is made to order. COLORS Finals colors are more deeper than its look at the mane photo file. PACKING Your new wall clock comes safely packed with dedicated box and bubble wrap envelope DELIVERY Registered air mail 12-24 working days.